Every morning Christian Kandlbauer wakes up, dresses himself, and gets in his car to drive to work. This may sound mundane, but for the 21-year-old Austrian these are remarkable feats. 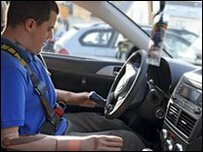 Doctors say he is the first person in the world to drive a car using a mind-controlled robotic limb. Four years ago Christian lost both his arms after being electrocuted by 20,000 volts. Now he is able to control all of the joints in his left prosthetic arm by merely thinking about what he wants his arm to do. He has a conventional prosthetic fitted on his right side. Experts at the medical technology company, Otto Bock Healthcare, which developed the mind-controlled arm, say it is the first project of its kind in Europe. On Wednesday, they will announce at an international conference in Leipzig, Germany, that the technology is ready to leave the laboratory and be put to everyday use. "UK patients could benefit in the next few months," says Dr Hubert Egger, head of the research and development project for the mind-controlled arm. "Christian is the first patient in Europe where this surgery was done, and the first person in Europe with this mind-controlled prosthetic. In the future we hope to fit patients in the UK with prosthetics like this." Dr Egger's team is publishing detailed surgical and technical guidelines for the mind controlled arm. It involves a new technique known as targeted muscle reinnervation (TMR), where nerves that once controlled a lost limb are used to control a prosthesis. Christian was the "guinea pig" for the four-year research project. Surgeons at Vienna General Hospital transplanted the nerves that previously controlled his healthy limb to the chest muscles in a six-hour operation. The transplanted nerves allow electrical impulses from the brain to reach the muscles in the chest. The muscles act like a booster, amplifying the signal to a level that can be picked up by electrodes on the surface of the chest. These signals are interpreted by a micro-computer, and used to control a prosthesis which responds in real time to thoughts from his brain. This allows him to control his prosthetic arm as if it were his real arm. Now Christian can drive, hold down a job, and even grasp a glass of beer. "I feel very happy," he told the BBC in a telephone interview. "It is like my earlier arm - I feel that my arm is a part of my body." Scientific improvements are bringing prosthetics ever closer to the real thing. They are now lighter, stronger, and more cosmetically appealing. But not all amputees may be able to afford advanced prosthetics. There is already a large discrepancy between what is available on the NHS and the expensive prosthetics provided to soldiers. Ernie Stables of the British Limbless Ex-Service Men's Association (Blesma) says anything that is likely to improve the quality of life for amputees is welcome. But he says expense will be a factor. "Limb centres across the country are pretty poorly funded as it is," he explains. "And I expect this initiative will be prohibitively expensive in NHS circles. "So yes, it is a significant advance, and UK patients could potentially benefit if the funding is there. "The private option is an avenue but only very few people can afford to go down that route." Otto Bock says it is difficult to put a cost on the procedure. The research project behind Christian's prosthetic cost several million euros. It says the cost will come down when the prosthetic goes into production. Four years on, Christian has returned to work as a warehouse clerk at the garage that once employed him as a mechanic. He has little memory of his accident and the days that followed. He says it was strange when the limb was first fitted as he couldn't imagine that it would work. Now, he is simply grateful that he has the freedom to get on with his life. "With the prosthesis I am able to do things in my daily life alone without the help of another person," he says. "I am independent."